There are different types of link-state advertisements (LSAs) that would be used for Open Shortest Path First (OSPF). This article contains List of OSPF LSA types with a short description. LSAs build up the OSPF link state database (LSDB), and they are exchanged between OSPF enabled nodes. Bellow short description of OSPF LSA types. LSA Type 1 (Router LSA): LAS type 1 are generated by every router of an OSPF area. They are flooded to all other routers only inside an area of origin & directly connected router. In the link-state ID you will find the originating router’s ID. LSA Type 2 (Network LSA): LSA type 2 are generated by DR and flooded into the area of origin. The link-state ID will be the router ID of the DR.
LSA Type 3 (Network Summary LSA): LSA type 3 are generated by ABR’s sent into an area to advertise prefixes to other areas & flooded throughout the Autonomous System. Type 3 LSAs are sent between two areas to allow inter-area communication. LSA Type 4 (ASBR Summary LSA): LSA type 4 are generated by ABR’s that advertises the ASBR & flooded throughout the Autonomous System. The link-state ID will be the router ID of the ASBR. LSA Type 5 (AS External LSA): LSA type 5 are generated by ASBR that advertises external networks outside the local Autonomous System. Also take the form of a default route to all networks outside the local AS. Type 5 LSAs are flooded to all areas in the OSPF throughout the Autonomous System. LSA Type 6 (Multicast LSA): This type of LSA is used for multicast OSPF applications. Cisco does not support it. 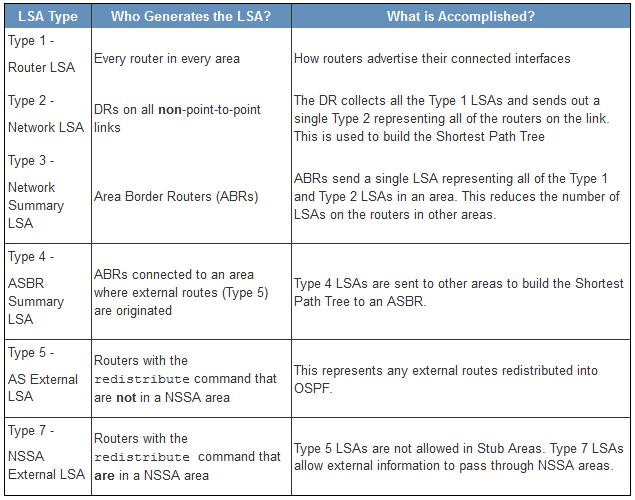 LSA Type 7 (NSSA External): LSA type 7 are generated by an ASBR inside a Not So Stubby Area (NSSA) to describe routes redistributed into the NSSA. LSA Type 8 (External attributes LSA For BGP): Used to work with BGP. LSA Type 9,10,11 (Opaque LSAs): For future use.